System preferences in Mac OS X or macOS as we now call it is the key to making changes to a whole raft of different settings on your Mac. Everything from changing your desktop background to sharing files and folders is configured using System Preferences. 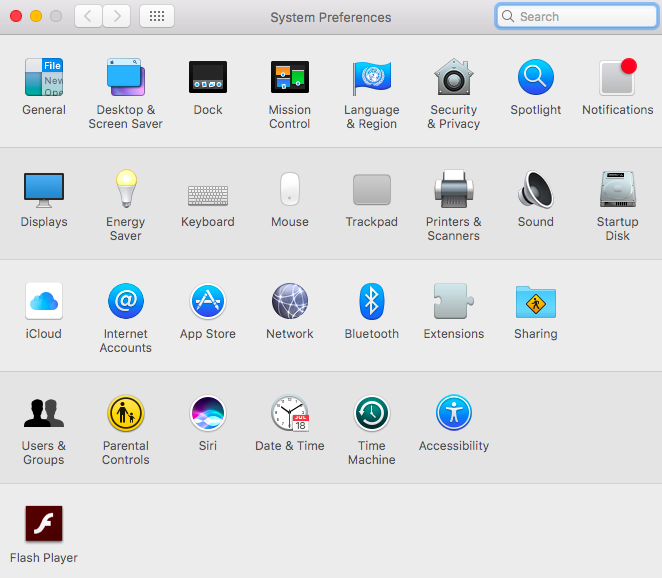 Where is System Preferences on Mac? System Preferences on Mac is an application that, unlike other macOS tools such as Disk Utility and Terminal, lives in your Applications folder — not in the Utilities folder. You can launch it from there like any other application. It’s also in the Dock. And if you don’t like either of those options, you can use the Apple menu System Preferences route, by clicking the Apple logo at the top left of the screen and choosing it from the menu. Once you’ve launched it, clicking on any tool, or pane as they’re known, will allow you to change the settings for that category. So, to change your desktop background you’d choose the Desktop & Screen Saver pane, or to set display resolution or configure multiple displays, you’d click the Displays pane. Tip: As well as launching System Preferences and clicking the pane you want to use, you can Ctrl-click System Preferences in the Dock to see a list of all the tools. Click on one to select it. The General pane is home to a number of settings that don’t belong anywhere else. 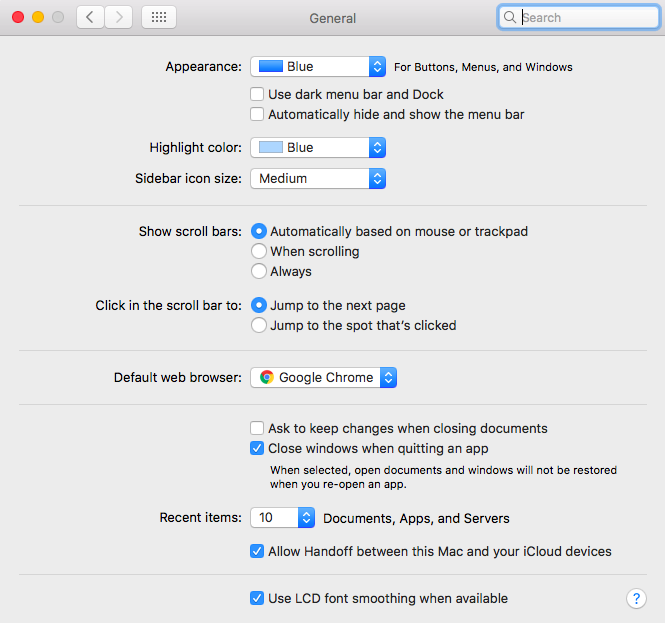 Here, you can change the color of menus, buttons, and windows in the Finder and the color used for highlighting selections. You can also configure the way that scroll bars in windows work. Perhaps more usefully, the General pane is also where you set your default web browser and specify whether your Mac asks you if you want to save changes when you close a document. Near the bottom there’s an option to enable Handoff, a feature of recent versions of macOS that allows you to start working on a document on one device and pick it up on another that’s connected to the same iCloud account. Click on Desktop & Screen Saver. 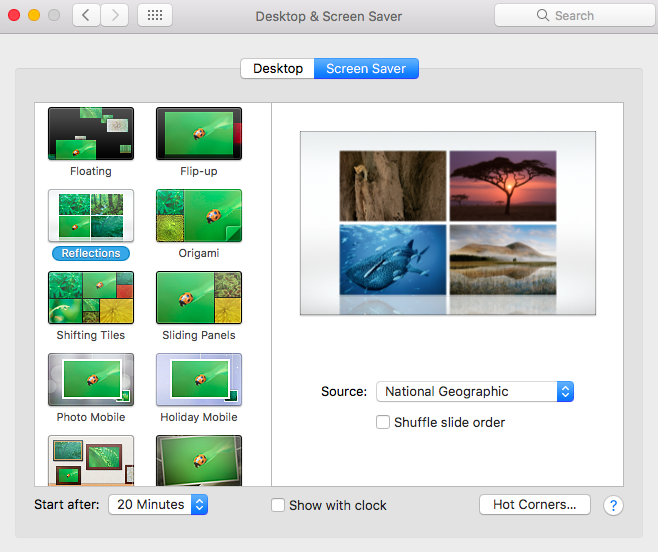 In the Desktop tab, choose from Apple’s pictures, photos from the Photos app, or images from your Pictures folder. To choose an image from a folder other than your Pictures folder, press the ‘+’ at the bottom of the window and select the folder. Check the box at the bottom of the window if you want the picture to change every 30 minutes. Choose a Screen Saver from the list. Choose a time period after which the animation begins from the menu. If you want to dig deep and change how the Screen Saver displays, click Screen Saver Options and play with the sliders. The Security & Privacy pane in System Preferences allows you to change your login password, control how your Mac behaves when it goes to sleep, and allows you to specify which applications have access to personal data. You can also turn on FileVault and make changes to macOS’ built-in firewall. FileVault allows you to encrypt files stored on your hard drive. However, it has a couple of down sides. One is that encrypting files consumes resources and may make your Mac run more slowly. The other is that if you forget your password and secure key, you’ll lose access to your files permanently. 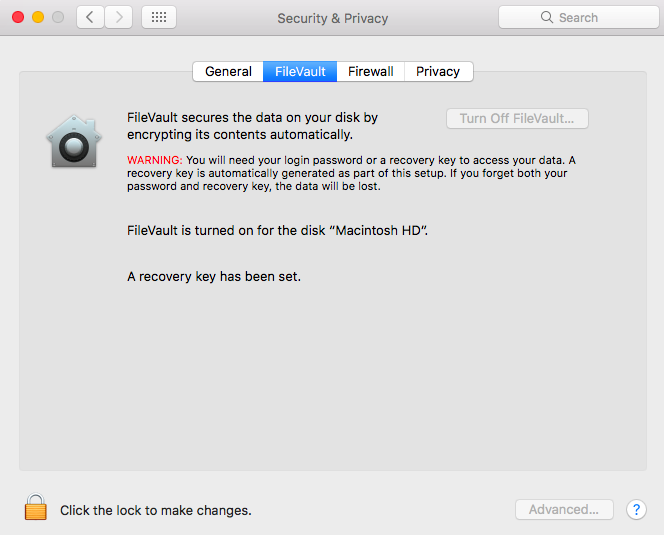 Unless you have a specific reason for encrypting files on your hard drive, it’s better to leave FileVault switched off. Likewise, you should leave the Firewall at its default settings unless you have a good reason to switch it off or change its settings. To change your password, click on the General tab in Security & Privacy and unlock the padlock by clicking it and typing in your user password, then choose Change Password. Type in your old password, then the new one, twice. Input a password hint if you think you’ll need one. App notifications can be very useful. They can also be intrusive and annoying. You can control which apps can issue notifications and how they do it by clicking on the Notifications pane in System Preferences. The first option on the left, Do Not Disturb, allows you to turn off Notifications completely at certain times or under certain conditions. Once you’ve set that, you can click on each app in turn and choose options for how Notifications are displayed or turn them off completely. 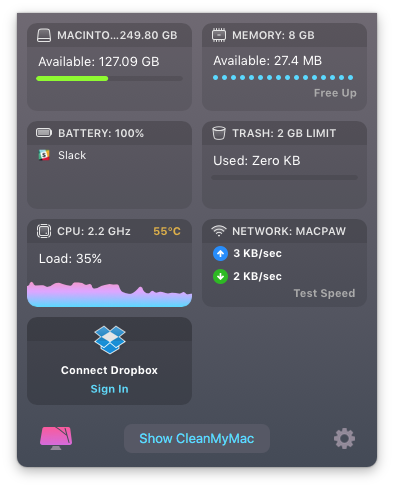 Tip: If you want notifications about potential problems with your Mac, such as memory reaching capacity, high disk temperature, or disk trouble, use a great app CleanMyMac X. Its Menu App will alert you as soon as it detects any issues. CleanMyMac is very easy to set up and use and will help keep your Mac healthy. And if it detects that you’re running out of usable memory, you can free up RAM at the click of a button. Spotlight, the tool that allows you to search both your Mac and the world beyond, is incredibly useful. But you can make it work better for you by changing some of its settings. Click on Spotlight in System Preferences. Click on Search results and uncheck any categories you don’t want to appear in results. For example, if you don’t want suggestions from iTunes, Wikipedia, or other online sources, uncheck Spotlight Suggestions. To exclude folders on your Mac from Spotlight searches, click on the Privacy tab and drag the folders onto the window. 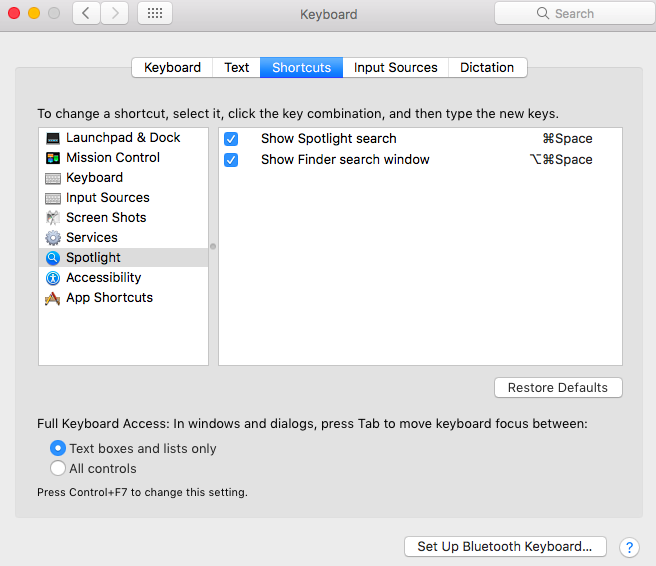 To change the keyboard shortcut for invoking Spotlight, click on Keyboard Shortcuts, then choose Show Spotlight Search and click on the keyboard shortcut. Press the shortcut you want to use for Spotlight. The Keyboard pane has a number of settings that allow you to control how your Mac’s keyboard operates. You can set the speed at which keys repeat when you hold them down, change keyboard shortcuts, and set up Dictation so you can speak to your Mac rather than type. One of the most useful Keyboard settings is in the Text tab, where it allows you to specify how to correct common typing errors. For example, if you regularly type ’teh’ instead of ‘the’, you can make it correct that automatically. Here’s how to use it. Click on the Keyboard pane in System Preferences and click the Text tab. Click the ‘+’ at the bottom of the screen. Type the mistake you often make in the Replace column, then type the text you want to replace it with in the ‘With’ column. 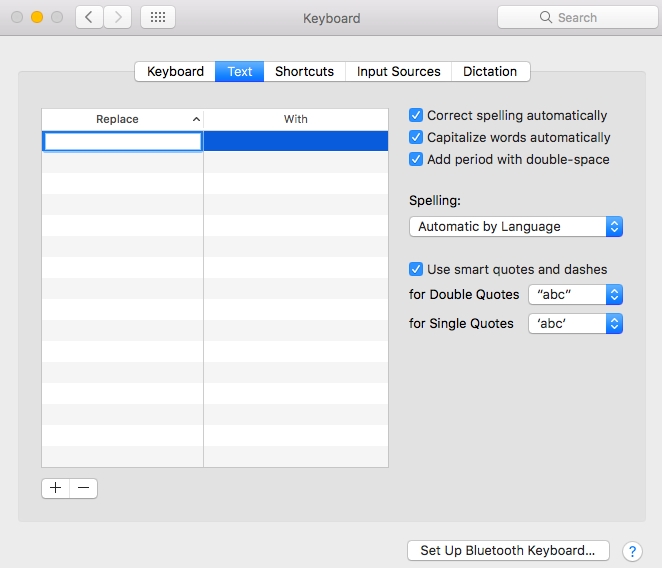 You can also use this feature to allow you to type abbreviations and have your Mac replace them with the full text. The Text tab also allows you to choose whether to correct spelling automatically, which dictionary to use and how to format quote marks. And you can add additional input source languages by clicking Input Sources and choosing a language. If you click on Input Source in menu bar, you’ll be able to easily swap between languages. In System Preferences, click on the Printers & Scanners pane. Click the Print tab, if it’s not already selected, and click the ‘+’ button at the bottom of the Printers window. Any printer connected to your Mac, AirPrint printer on your WiFi network, or wired printer on a network you’re connected to will show up in the window. Click the one you want to add and click Add. If you have connected multiple printers, click on the Default Printer menu and choose the one you want to use as the default. The Internet Accounts tab is where you can add email or social media accounts to your macOS user account. The email accounts will show up in Mail, while the social media accounts will be available in other apps or when you choose to share something using Share Sheets. Click anywhere in the left-hand column. Press the “+” button at the bottom of the column and choose Gmail (if you want to add another type of email or social media account, choose that instead). Type in your Gmail address in the window that opens. Type in your Gmail password to log into the account. When the account has been added, check the items in the right-hand window that you want to use with this Gmail account. 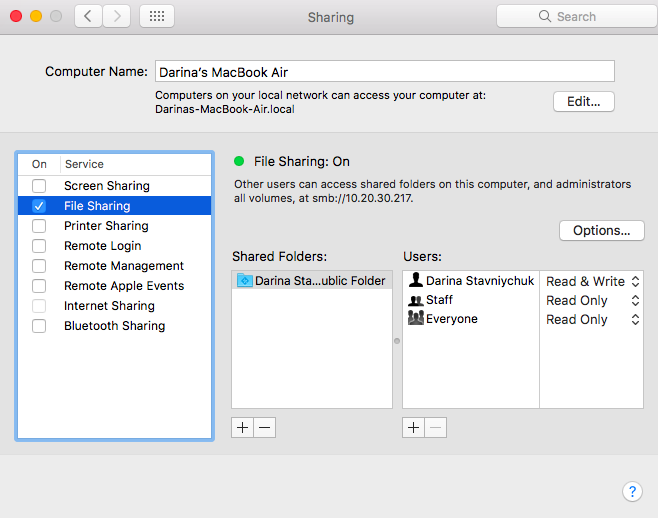 The Sharing pane in System Preferences allows you to share a range of different data and services on your Mac with other computers on the same network. The three most useful are Screen Sharing, Printer Sharing, and File Sharing. Screen Sharing allows you share your Mac’s screen with another computer so that you can view its display and control it remotely from another computer. This is particularly useful if you want to set up a Mac mini without a monitor and control it from another Mac, or if you want to help troubleshoot problems on someone else’s Mac. To enable Screen Sharing, click on the Sharing pane and unlock it. Check the box next to Screen Sharing and then choose which user accounts to allow access to. File Sharing allows folders you choose to be shared with other users. Click File Sharing, beneath Screen Sharing, and click the “+’ to specify which folders to share. Set privileges in the Users window. If you want to access the folders over a network, click Options to choose how they’re shared. 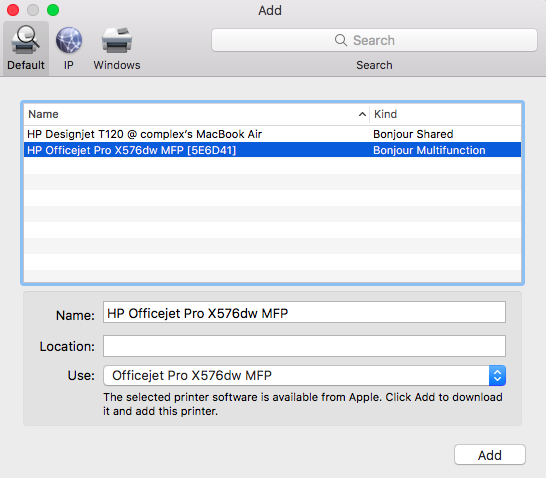 If you have a printer directly connected to your Mac, you can share it by clicking Printer Sharing and choosing the printer. Sometime apps configure themselves to open automatically at login. If you no longer want them to do that, click on the Users & Groups pane and unlock it. Click the account you want to manage and then choose Login items. Click on the one you want to remove and click the “-“ at the bottom of the window. You can also change account passwords, pictures, and privileges in Users & Groups, as well as alter the way the login screen looks. Tip: If you want to see the list of all your login items and remove them in a click, use the app we've mentioned about — CleanMyMac X. Go the Optimization > Login Items to manage the apps that launch at startup. 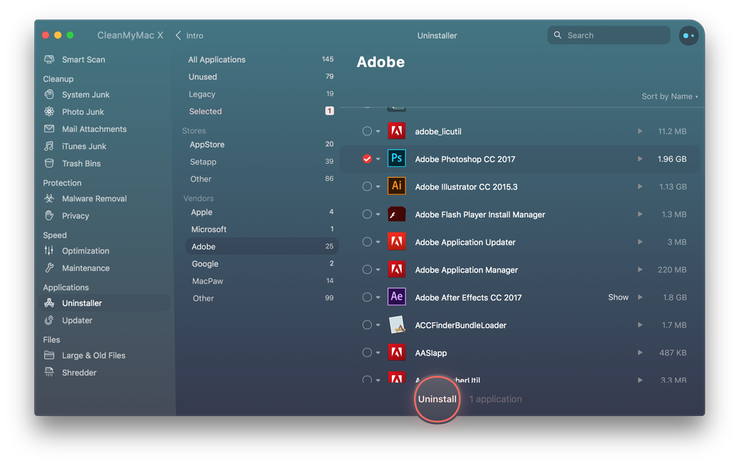 If you want to uninstall applications altogether, rather than just stopping them launching automatically, use a dedicated tool Uninstaller, that will remove the application and all its associated files from your Mac and the click of a button. Click on the Siri pane. Make sure “Ask Siri” is ticked. Click on the menu next to “Siri Voice” and choose the voice you want. 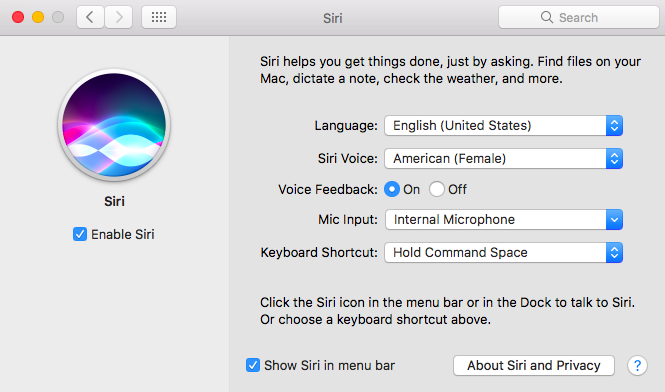 If you’d rather type Siri questions than speak them, click on the Accessibility pane in the main System Preferences window. Click on Siri in the left-hand sidebar and check the “Enable Type to Siri” box. If you want to set limits on the way children use your Mac, choose Parental Controls in System Preferences. Unlock it and then click on the user account you want to set controls for. Click on each tab in turn, setting the options as you want them. As you can see, System Preferences has some very useful features for setting up and configuring your Mac. While there are lots of options, it’s not difficult to use and nothing you can do there will harm your Mac. 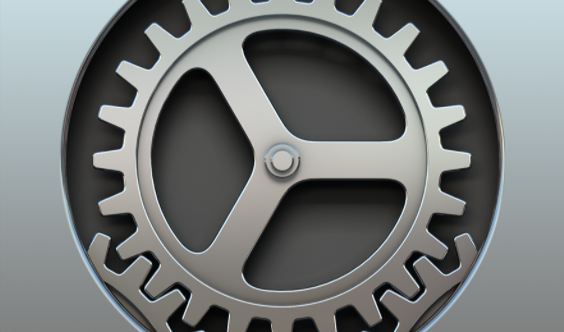 Use the tips above to get your Mac configured and running exactly the way you want it.